This feature is only available on our Business and Premium Plans. The Refer Friends feature encourages people to share your sweepstakes with their friends via email in order to earn bonus entries. 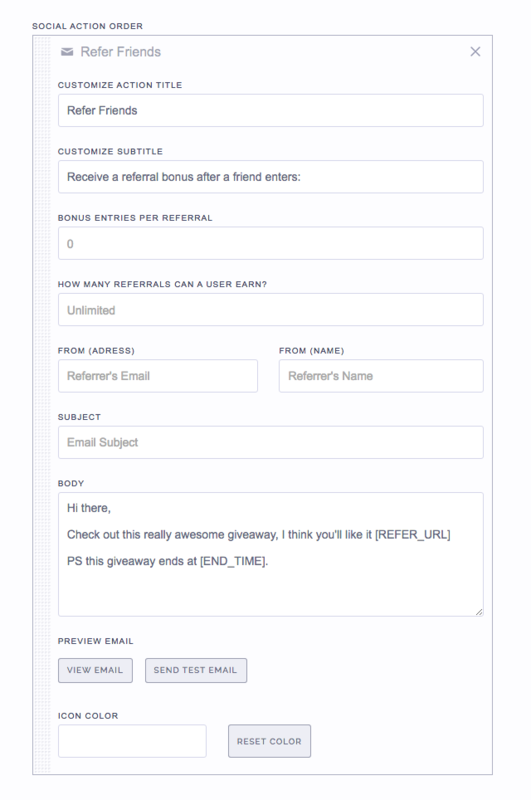 When a user enters your sweepstakes, they will see the Refer Friends box which allows them to type in a friend's email address and invite them to the sweepstakes. Users will only receive bonus entries when a friend that they refer actually enters the sweepstakes. Select the Refer Friends feature under Social Actions when putting your sweepstakes together. First, you can change the default text we use for the action under the action title and subtitle fields. Next, you can change the number of bonus entries awarded per referral, and you can cap the total amount of referrals a user can earn (if you do not cap it, then the default is unlimited). This is the email address that the email will be sent from. We suggest leaving this blank, as the email will come from the person who is actually referring someone. However, if you want the email to come from your company instead, then you can enter your company email address here. This is the name of the person who is sending the email. We suggest leaving this blank, as we will use the name of the person who is actually referring someone (if they provided their name when entering the sweepstakes). However, if you want the email to come from your company instead, then you can enter your company name here. This is the subject of the email that will be sent out. Be sure to keep it clear and concise and do not make it misleading or deceptive. In the body of the email, we provide you with a default message that you can use, along with parameters that you can utilize. The body field accepts both plain-text as well as HTML. If you currently have an HTML email template that you use, you can copy and paste it into the body field. This will add the users first name if you have the name field added to your sweepstakes. This will display the users referral URL. This will display the email address of the person who entered the sweepstakes. This will display the end time of the sweepstakes. Once you have input the proper information, you can view the email you have put together by clicking the view email button, or you can send yourself a test email. The test email feature is purely to see what the email will look like. We do not fill in the parameters in the test email, so you will not see a referral URL, or the end time, etc. If you want to do a live test of this where all the parameters are filled in, you will need to run a live test on your sweepstakes. Will I receive the email addresses of those who were referred if they did not enter the sweepstakes? No. You will only receive the email addresses of people who enter the sweepstakes. If someone referred a friend and that friend did not enter, you will not get that email address as they did not opt-in to your sweepstakes. Can a user upload an email list to send out emails to all their friends at once? No. This encourages spam, which we strictly prohibit. A user must type in email addresses one at a time to invite people to the sweepstakes. How do I know what the email will say that gets sent out when people refer their friends? You have full control over this email during the setup phase. Please refer to the setup section which will explain in detail how to modify the email that is sent out. Does a user get bonus entries every single time they invite a friend? No, users do not get bonus entries simply for inviting people. This is strictly referral based, so the user can only earn a bonus entry when the friend that they invite clicks on the link in the email they receive and enters the sweepstakes. Is there a limit to the number of referrals someone can receive? By default, we leave referrals set to unlimited. 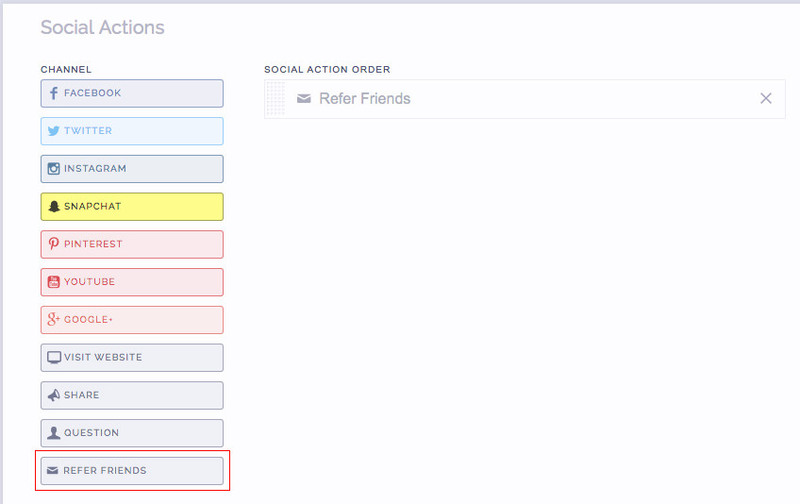 You can cap referrals if you would like by modifying this when configuring the settings for the Refer Friends action. Still having trouble with the Refer Friends feature? Simply click the support or live chat icon to get in touch with us.